The world has lost one of the pillars of modern vision research and ophthalmic clinical care, Dr. Matthew Dinsdale (Dinny) Davis passed away Monday, March 5 surrounded by loved ones. He leaves a legacy of accomplishment as a clinician, educator, leader and tireless researcher at the University of Wisconsin School of Medicine and Public Health for more than sixty years. He is recognized worldwide for his work as a pioneering retina specialist who helped establish standards for analyzing diabetic retinopathy and other eye diseases. Dr. Davis was born in Madison in 1926. He earned his bachelor’s degree in 1947 and completed an ophthalmology residency in 1955 at UW-Madison. After two years in the U.S. Naval Reserve, he received more training at Massachusetts Eye and Ear Infirmary. His father—Frederick A. Davis, MD— and Peter Duehr, MD, were partners in a Madison-based practice and consecutive leaders of the Eye, Ear, Nose and Throat Division of the School of Medicine and Public Health Department of Surgery. Matthew Davis joined their practice and the UW faculty, where he rose to the rank of professor and head of the division. He helped elevate the division into the Department of Ophthalmology and Visual Sciences and served as its first chair from 1970 to 1986. Dr. Davis gave up his private practice to have time to oversee the expansion of the department’s ophthalmology residency teaching program, and the recruitment of several clinical and basic science faculty members. 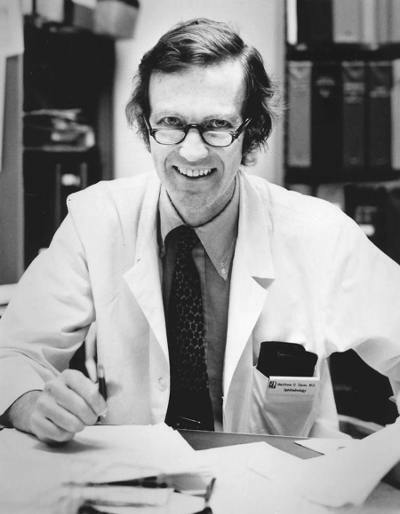 In 1971, the newly established National Eye Institute of the National Institutes of Health asked Davis to serve as study chair for the groundbreaking Diabetic Retinopathy Study (DRS). Results of the seminal DRS study established scatter laser photocoagulation as the standard therapy for proliferative diabetic retinopathy, eventually substantially reducing the risk of severe vision loss. At that time, approximately half of all patients diagnosed with diabetic retinopathy became legally blind within five years. Over the next decade, that figure dropped to five percent, and the DRS was a critical component of that success. The seminal DRS randomized controlled clinical study established the template for future eye trials. Dr. Davis formed the Fundus Photograph Reading Center (FPRC) for ophthalmology clinical trials - the first centralized, independent research center for randomized clinical trials of retinal diseases. With his collaborators, he established the Early Treatment Diabetic Retinopathy Study Classification of diabetic retinopathy severity, a gold standard that continues decades later in trials of diabetic retinopathy. He also collaborated in the development of the Age-Related Eye Disease Study Classifications of age-related macular degeneration and cataract-related lens opacities, still considered the gold standard. Dinny, as he was known to his friends and colleagues, has received multiple honors over the span of his career. He was named the 2016 Laureate by the American Academy of Ophthalmology for his pioneering contributions to the field. In addition to his multiple honors and awards in ophthalmology, he has authored or coauthored more than 270 papers and book chapters, and served as a mentor for countless faculty, staff and trainees.